Offenders in the community and prison are being encouraged to take the time to remember those who have fought for our freedom, with a number of activities being planned in commemoration of Anzac Day. In Wellington, a wreath of remembrance made by five young offenders was presented in the Hall of Memories at the National War Memorial on Thursday. The offenders have been participating in the Mauri Toa Rangatahi (“the power of youth”) programme; addressing their lifestyles, including; relationships, substance abuse, problem-solving and emotions. 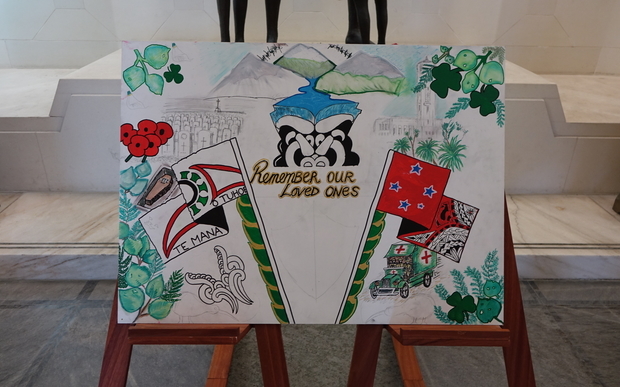 The wreath of remembrance presented to the National War Memorial, made by offenders participating in the Mauri Toa Rangatahi (“power of youth”) programme. Image courtesy of the Department of Corrections. Last week the young people toured the Great War Exhibition and Pukeahu National War Memorial Park. Following the visit, they wanted a way to express their thoughts and emotions. Earlier in the week, young offenders completing the same programme in Hawke’s Bay attended the Taradale Returned Services Association to hear from war veterans. The men spoke of the impact of war on their families and the sight of casualties and badly hurt comrades. The young men were encouraged to reflect on what the poppy meant and to consider wearing a poppy and attending a dawn service. This weekend, offenders serving community work sentences will attend Whenua Tapu Cemetary, near Porirua, to place poppies on the graves of servicemen and women who are buried there. Anzac Day has a special significance to many Corrections staff who have military backgrounds. “It brings me great pride to think of them wearing their medals and participating at dawn services across the country. It’s a true testament to their passion and dedication to our country,” says Mr Lightfoot.